Could one of these futuristic features be in your home soon? We are seeing some great innovations as we ride this wave of 21st Century technological development. Houses are being built to be more environmentally friendly with features like bamboo flooring and reclaimed lumber. Paint is low/no VOC. Use of high efficiency, water conserving appliances is becoming the norm. We see high efficiency water heaters and washing machines and low-flow showerheads and faucets. Dual flush toilets significantly cut down on water use. A shift is under way that will lead to widespread adoption of electric vehicles in the next decade. According to Bloomberg.com, by 2040, thirty-five percent of new cars worldwide will have a plug. With the popularity of electric cars growing, there will be more car charging stations right in the home garages. Solar panels, which can be an eyesore, are in for some exciting updates. Tesla has just unveiled its version of solar roof panels, which are made to look like regular shingles. They come in different styles, even slate and Spanish clay. The shingles are tinted and made of tempered glass and quartz, so they are said to be incredibly durable. 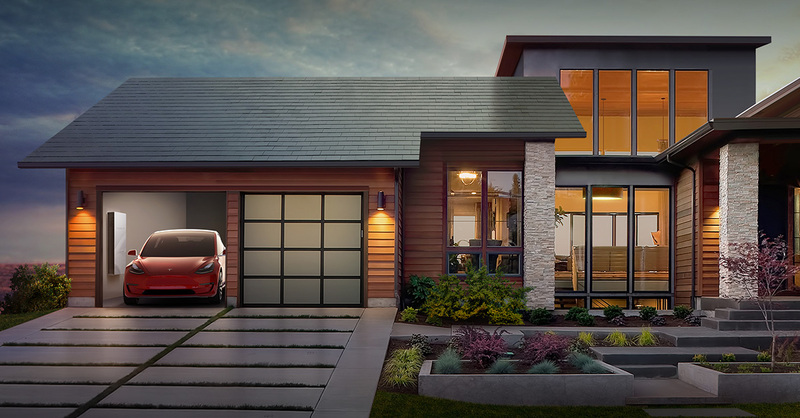 Elon Musk says this will “look better than a normal roof, generate electricity, last longer, have better insulation, and actually have an installed cost that is less than a normal roof plus the cost of electricity.” To read more about this innovation, visit https://www.tesla.com/solar.It’s an exciting time to be a homeowner. We look forward to seeing more of these features in homes as we move forward.